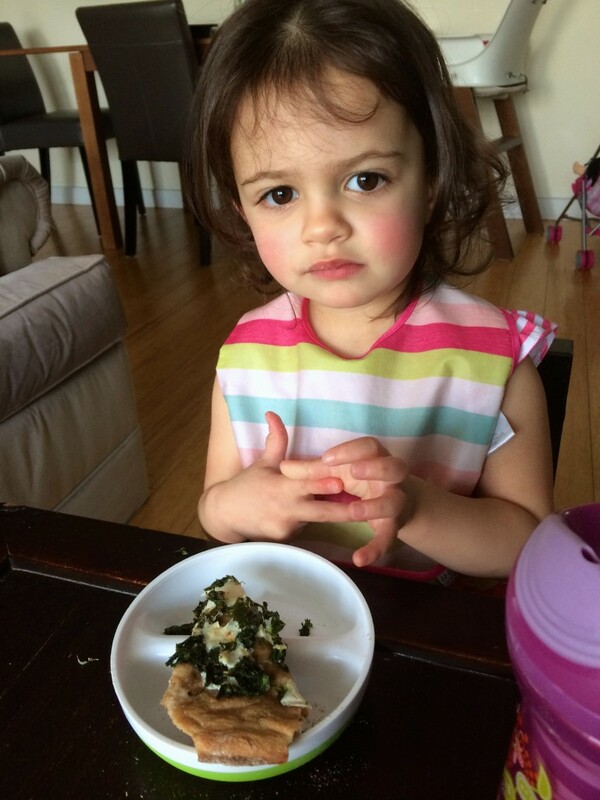 For this week’s Monday Meal, I’m sharing a recipe that combines two of my favorite foods: kale and pizza. 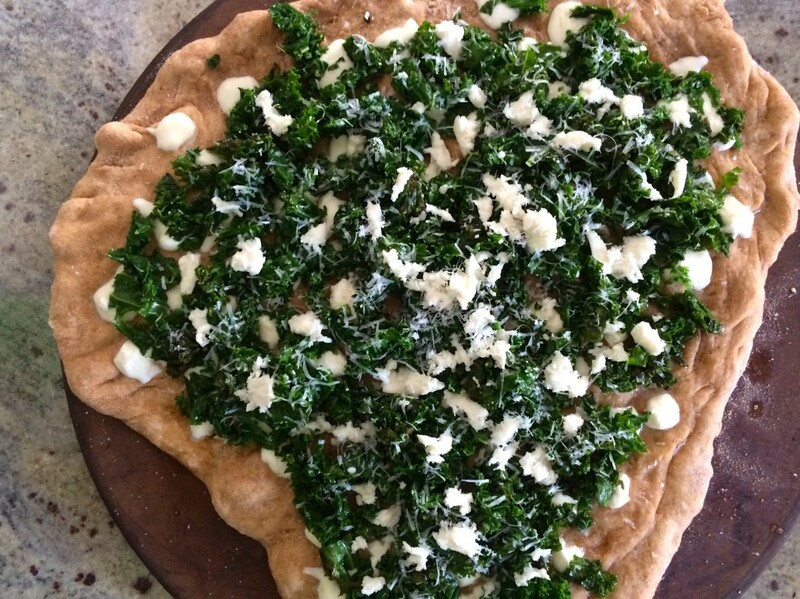 I love that this recipe combines a super healthy vegetable with protein from the cheese and starch from the crust to create a tasty, healthy and balanced meal. Besides creating a recipe that combines two of my favorite foods, I am also able to cross off an item from my “Chef’s Bucket List” by making fresh pizza dough. I had always assumed making fresh pizza dough would take forever, but I found this recipe online that only takes around 90 minutes. I adapted the recipe by using 2½ cups whole-wheat flour and 1½ cups all purpose flour and also by adding around 1 teaspoon of garlic powder. 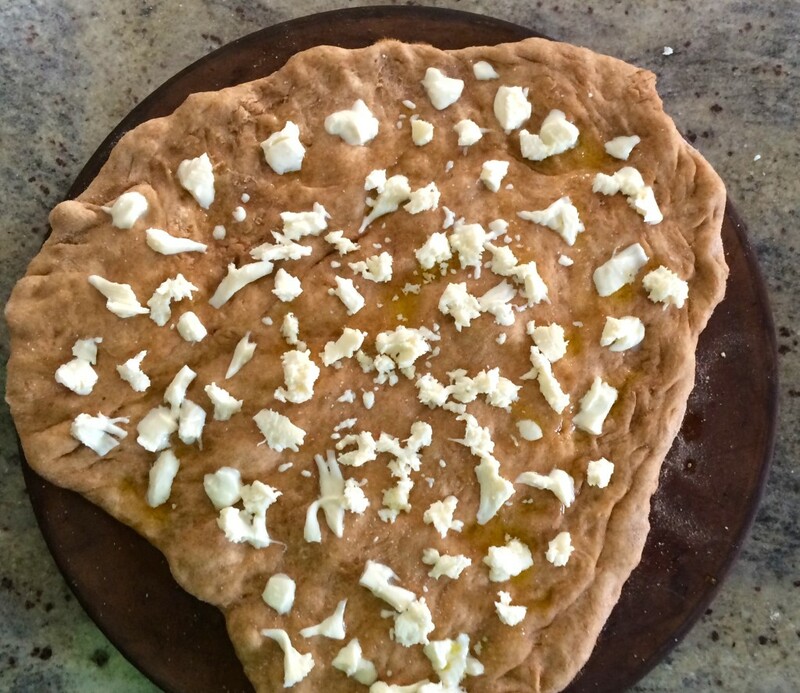 You can certainly use fresh dough from a grocery store or local Italian restaurant, too. For this recipe, I included directions for using either a pizza stone or a baking sheet on which to cook the pizza, so be sure to follow the steps that match your cooking tools. Don’t want to use your oven at all? Click here for instructions on How-To Grill Pizza. If you’re new to making pizza using fresh dough, click here for some tips and ideas about working with fresh dough. Enjoy! If you’re using a pizza stone: put it into the oven to heat up while the oven warms. Once the oven reaches 450°, let the stone stay in the oven for an additional 30 minutes before carefully removing it when you’re ready to top it with the raw dough later in the recipe. If you’re using a baking sheet: you don’t need to preheat the baking sheet. Lightly oil the baking sheet with olive oil later in the recipe before placing the raw dough on top. Heat olive oil, garlic cloves and red pepper flakes in a large pan for around 2 minutes until the garlic begins to brown. Add the kale and a couple pinches of salt. Stir and sauté for around 4 minutes or until the kale begins to wilt and shrink down, stirring occasionally, then transfer to a plate to cool. 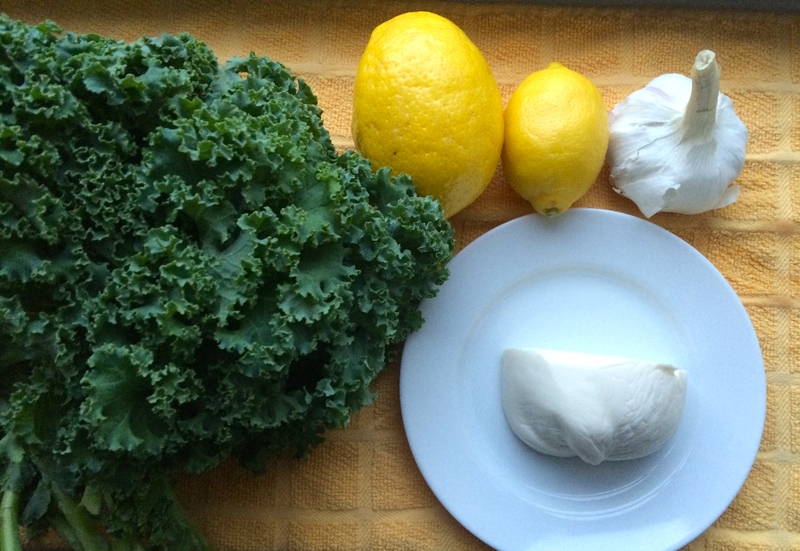 Once it has cooled, remove the garlic cloves, transfer the kale to a clean kitchen towel or paper towels and squeeze the water out of the kale. Then, finely chop it. 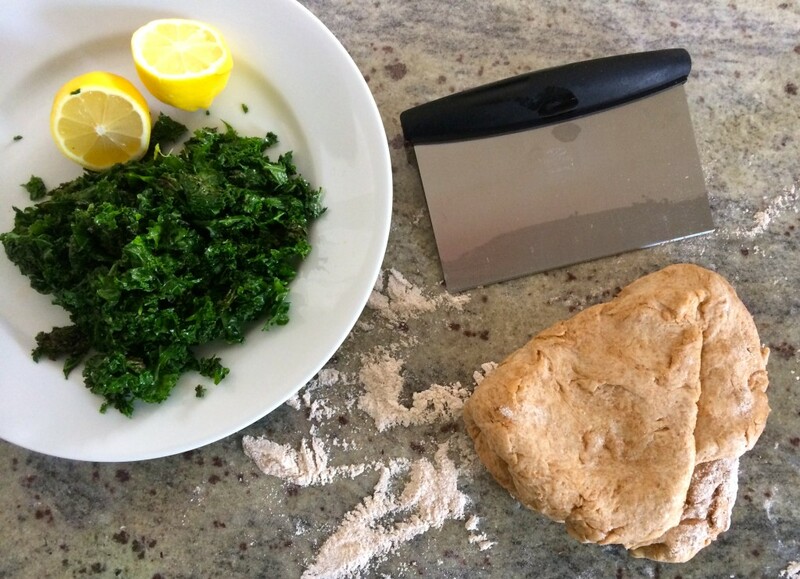 Onto a lightly floured surface, spread out the dough to fit your pizza stone or baking sheet. Once the pizza stone has warmed (if using one), carefully remove it from the oven. 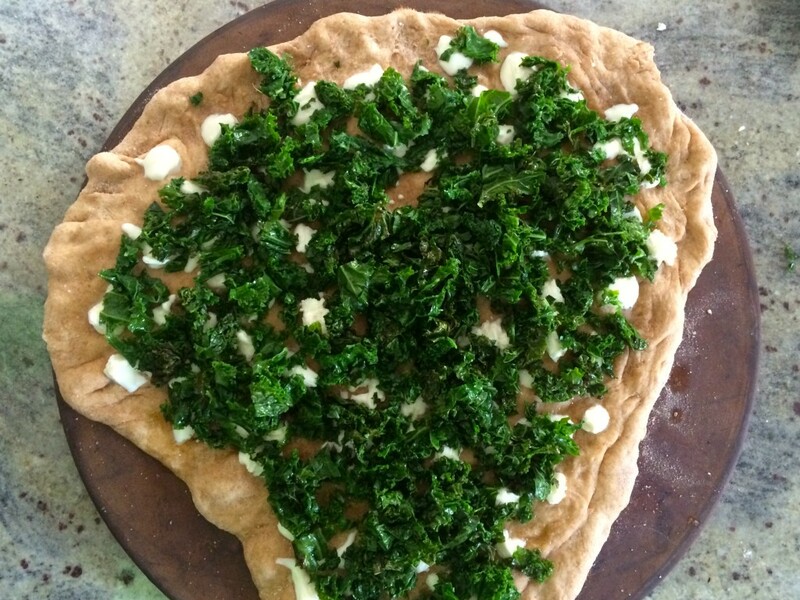 Gently and carefully, lay the dough out onto the pizza stone or baking sheet and bake it alone for 2 minutes. Then carefully, remove the pizza stone or baking sheet in order to build the pizza. Drizzle dough with olive oil. Then top with ⅔ of the mozzarella cheese. Spread the kale over the cheese, sprinkle with a bit of salt, pepper and cayenne pepper. Then add the rest of the mozzarella on top of the kale. Sprinkle the grated locatelli cheese over the top and bake for 10-13 minutes. 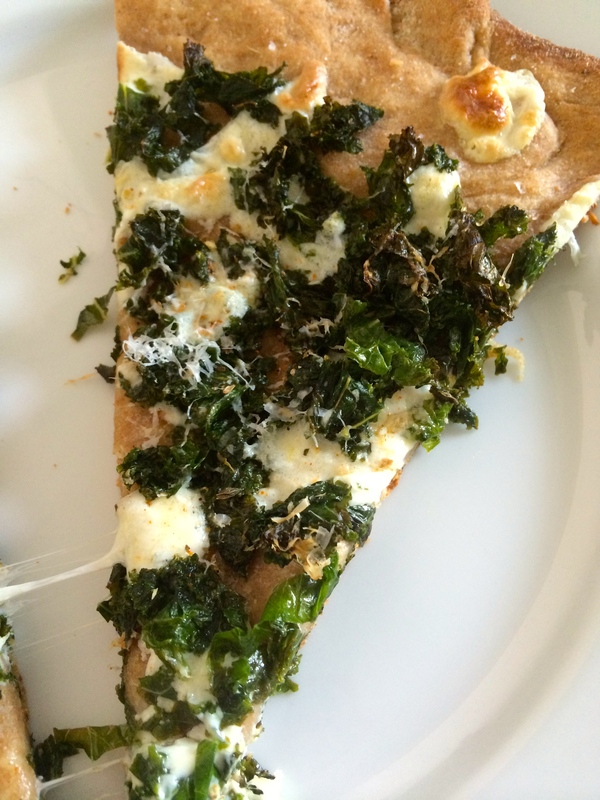 Top the par-cooked crust with olive oil and most of the mozzarella cheese. Then add the cooked kale. Top that with the rest of the mozzarella cheese, the spices and some locatelli cheese. Then bake it! Once the pizza comes out of the oven, let it sit for 1 minute. Then, drizzle fresh lemon juice over the top, top the pizza with the lemon zest, sprinkle on some oregano, add more grated cheese as desired, and enjoy! Yeah, yeah. It’s pizza. You know I’m weird about whether or not I like pizza so I’ll just start with the crust. Oh, wait. That’s kale on there! I want to get the most kale to tongue contact as possible here! Found this on pinterest. Used a prepared dough and different cheese, (what I had on hand), and it was delicious! Thank you so much for this recipe! I’m so glad you liked it! Thanks for taking the time to share your thoughts. What cheese did you use? Sounds delicious Jory! 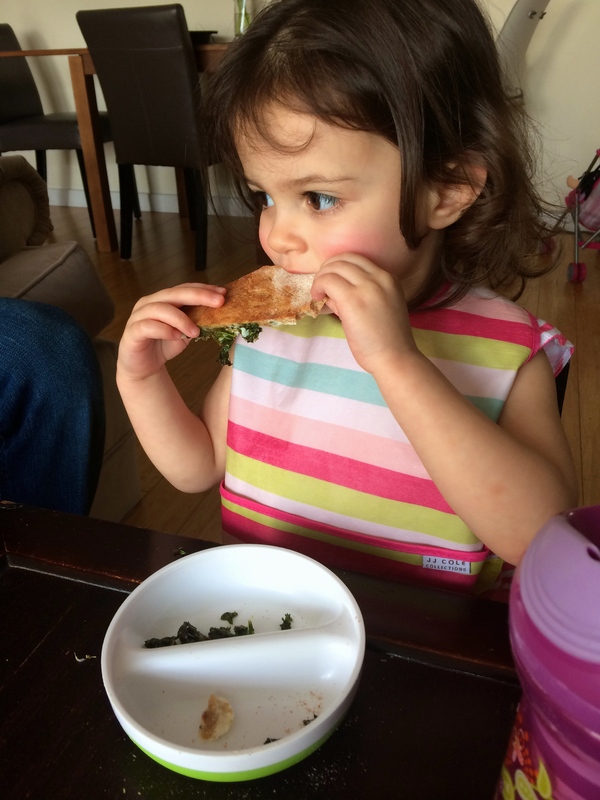 I will have to try this out…love making pizza at home! It’s so fun for the whole family to join in!